Monkeys, reports the San Diego Zoo website, are "very social animals." They make noises, faces and gestures to "get their messages across." When a monkey smiles, he or she may not be happy. The monkey may instead be showing aggression. But these tree-loving mammals also express affection--often by grooming each other, writes the zoo website. Spend an afternoon in the jungle with these furry mammals by leading your children in a paper monkey art project. Choose monkey patterns that children can easily trace, cut and decorate. Encourage your children to be creative. And don't forget a few monkey noises. Print the "Toilet Paper Monkey" template from Easy Child Crafts. See references section for the link. Simply let your children color the template, and then help them cut out the parts. Use a glue stick to assemble the parts on an empty toilet paper roll. 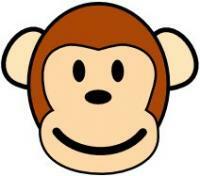 Create a monkey face using one sheet of construction paper by printing a monkey face template. See references section for the link. You may have to print the template and enlarge it by 100 percent. Your children can use the template as a model to draw a free-form monkey face, or they can cut out the face and trace it on a blank sheet of construction paper with a pencil. Use markers and glitter glue pens to add decoration. Consider gluing a pair of plastic doll eyes, available at your local craft store in the doll section, where the template indicates the monkey's eyes should go. Glue a tongue depressor to the back of the monkey face so your child can hold the monkey face up to his own. Make a monkey in a tree with First Palette's children's art project. Print the monkey and banana bunch template. See references section for the link. First Palette recommends you print on an 8.5-by-11 piece of cardstock. Allow your children to color the monkey and bananas, and then use child-safe scissors to cut out the parts. Use tape to secure the monkey and banana bunch to a green paper tree you can construct by following First Palette's tree template directions. See references section for the link.